The Pininfarina Enjoy concept from the 2004 Louis Vuitton Classic held in England is an update of a 2003 concept bearing the same name. 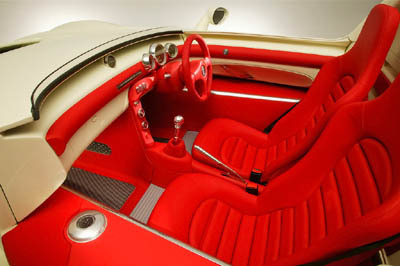 The Enjoy was intended as an exclusive limited edition model of only 100 cars. 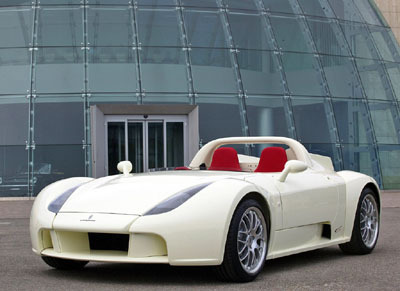 And is the culmination of a project between Pininfarina and Louis Vuitton. The Enjoy is an expression of pure driving pleasure and the car is able to transform from a sleek aerodynamic sports car to an open wheel roadster by removing the sleek carbon fiber wings. 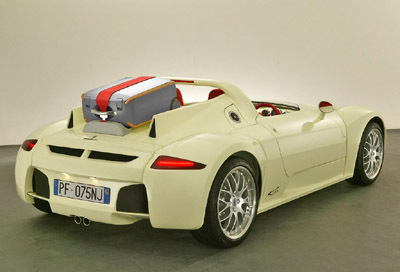 The Pininfarina is a purist sports car and lacks a windshield, and any luggage is transported in a separate supplied suitcase attached to the rear deck. The engine of the Enjoy is a 189 bhp 4 cylinder Toyota lump tweaked by Lotus Engineering and the concept is capable of 155 mph and reaches 60 mph in 5.2 seconds. Louis Vuitton designed the interior of the Enjoy and this being an open car, the materials chosen for the interior feature a combination of non-tanned chrome-coloured leather and weather-proof neoprene textiles, which lend a sporty but luxurious feel. And because the Enjoy lacks a roof and windscreen, the company came up with a matching protective helmet.